As many as 2.5 million working parents are overly stressed by concerns about after-school childcare and are likely to become less productive at work, according to a new study by the Women’s Studies Research Center at Brandeis University and Catalyst, a nonprofit research and advisory organization. There are over 52 million working parents in the United States. 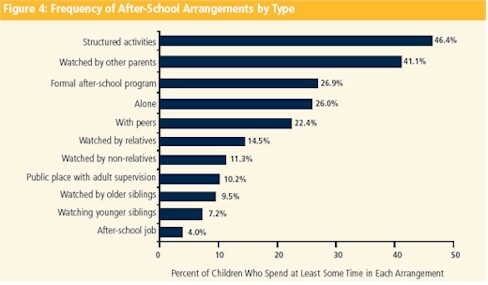 The new report “After-School Worries: Tough on Parents, Bad for Business,” finds that Parental Concern about After-School Time (PCAST) contributes to worker stress, which costs businesses between $50 billion and $300 billion annually in lost job productivity, according to the American Institute of Stress. This loss in productivity is manifested in a range of indicators, from minor disruptions to lower overall job satisfaction, according to the report. More than 75% of the survey respondents said that the flexibility to arrive at work later, leave work earlier, or take off part of a workday when necessary significantly reduces general levels of PCAST. Based on a survey of 1,755 employed parents (44.7 percent fathers, 55.3 percent mothers) who work at one of three Fortune 100 companies across the United States, the study finds that both men and women are vulnerable at significant levels to the negative consequences of PCAST, which potentially affects one-third of the labor force. This study was sponsored by Citigroup, Fannie Mae, and Pfizer corporations. Full report in PDF is available here.